The Index opened flat to negative and after staying in a narrow range moved up to the highs of the day at 8191 but was sold vehemently back to the lows of the day to close in Red at 8114.70, small loss of 15.95 points. The broader market though was positive, with 794 advances to 692 declines. 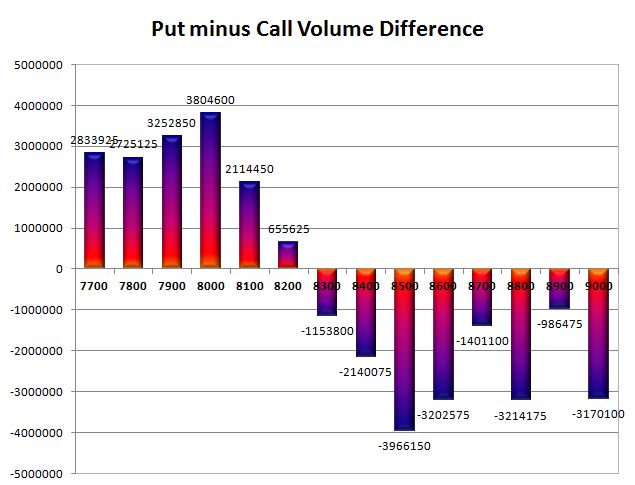 The broader range as per Option Table stays at 8000-8500. Call option 8000-8600 added huge 11.20 lacs OI with profit booking seen at 8700 and above strike prices. Put option 8200, 8000-7700 added huge 13.41 lacs OI with short covering seen at 8300 and above strike prices. 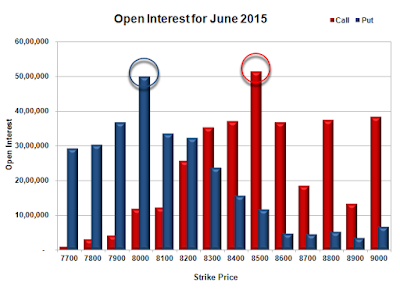 Nifty Open Interest is at 1,63,34,750 up by 78,500, with small decrease in price, most probably short build-up. 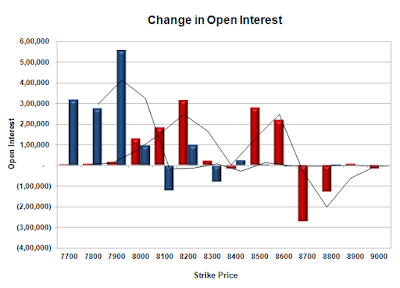 Bank Nifty Open Interest is at 23,59,725 up by 62,075, with decrease in price, most probably short build-up. FII’s sold huge 5.16 lacs Futures, which includes 71364 contracts long build-up and 92001 contracts short build-up, with increase in net OI by 33679 contracts (includes 71364 longs to 92001 shorts for the day) and the Average Price comes to 8316.51. FII’s Index future open contract as on date is 416506 Longs to 398324 Shorts, Net Long 18182 contracts. 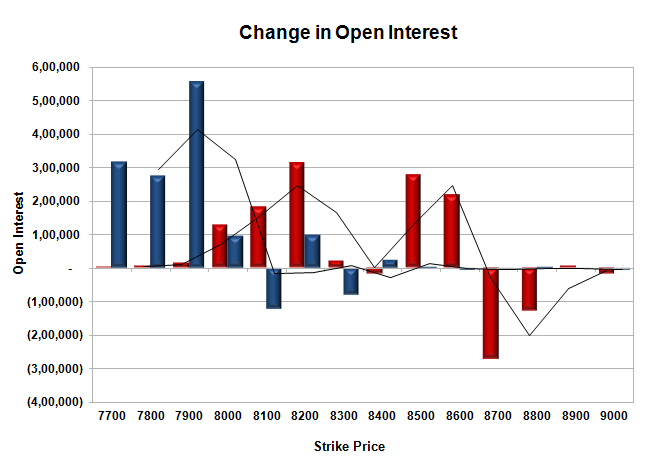 Initial support still at 8100, with OI of 33.46 lacs and below that at 8000 with OI of 49.97 lacs. Initial resistance at 8200, with OI of 25.69 lacs and above that at 8300 with OI of 35.06 lacs. Day Range as per Option Table is 8050 - 8213 and as per VIX is 8038 - 8192 with 8135 as the Pivot.